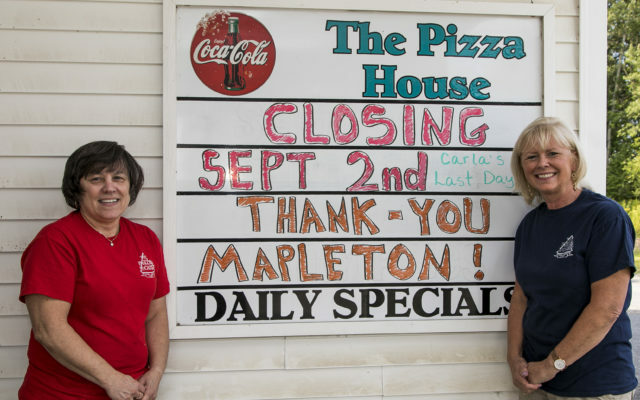 The Pizza House of Mapleton closed Sept. 2, 2018 after 17 years of operation. In the spring of 2001, Glendon and Anne Braley purchased the home from Eb Lovely that was to become The Pizza House. Knowing they needed to do something with the house, an opportunity came in the form of the closure of the original Mapleton One-Stop, owned by Rino and Flora Boucher. The Braleys were able to purchase the commercial kitchen equipment that included the pizza oven and grill and move them to the house to start a restaurant. After 17 years, this equipment is still in use today. But the treasure in the new venture was their ability to hire from the Mapleton One-Stop Flora Boucher, Carla Carney and her daughter Jenn. These women had already gained a reputation for great pizza and developed a significant following among the families of Mapleton, Chapman and Castle Hill. Anne and these three ladies would become the heart and soul of the new Pizza House. On the night before opening, Anne remembers how worried she was as to what might happen the next day. At the opening on November 16, 2001, things did go crazy — crazy good. Many people came to buy Carla’s and Jenn’s wonderful pizza. At the beginning, Anne managed the restaurant, Glendon handled business functions and Carla and Jenn cooked and served the food. Glendon turned business functions over to Anne and after a few years, Carla became the day-to-day manager. Carla’s promotion allowed Anne more time with her families, who have thanked Carla many times for giving them more time with their mother. The restaurant began as take-out only. When the Mapleton Restaurant closed, they decided to open for lunch and offer an eat-in service. When Anne and Glendon decided they would host a 16th birthday party for their son, Isaac, the shortage of space led them to add the back dining room. Over 80 percent of their regular customers are from the tri-town area, but there are regulars from across the country who visit in the summer and find their way to the Pizza House. The relationships formed with their customers are a hallmark of the restaurant. Over the years, The Pizza House has been part of the community, hosting family functions, sports team celebrations and senior citizen gatherings. In the fall, there were hunters, in the winter snowmobilers and in the summer ATV riders. They made many birthday cakes and ice cream cakes. Recently two wedding receptions featured pizza from the Pizza House. Their community involvement included supporting Mapleton Daze, sponsoring a Little League Team, providing fundraising certificates for charity auctions, providing pizza for Reading Night at the Mapleton Elementary School and hosting the senior citizen group (twice on Anne’s birthday). Anne grew up in the restaurant business as her grandfather founded the famous Moody’s Dinner, where she worked as a waitress and cashier. However it was the unique bond that Anne and Carla developed that made The Pizza House a special eating experience. Anne said Carla and Jennare a terrific mother-daughter team who worked well over the years with the 40 or so young women who worked at the restaurant. For most of these young workers, The Pizza House was their first job. The plan to close The Pizza House began to develop a couple of years ago when Carla indicated she would retire at the end of August this year, as she felt it was time to slow down. Anne will increase her work in the family’s expanding rental property business in Mapleton, Presque Isle and Bangor, as well as spending more time with their grandchildren. She will keep the restaurant intact, hoping that an interested party will be interested in buying and reopening the restaurant. Both Anne and Carla have stories to tell: the time customers would not leave while there was a fire in the kitchen, or video of a break-in by a homeless man who did substantial damage to the restaurant. Then there was Walter Scott’s famous football party; Carla delivered pizza for the party for the past 20 years. Anne and Carla are excited for the future, but both found it difficult to say goodbye.